Randall Dottin, winner of the Gold Medal in the narrative category at the Student Academy Awards, with AMPAS president Frank Pierson in Los Angeles on Sunday. Image © AMPAS. The 31st Annual Student Academy Awards honored the work of fourteen students from nine universities in a ceremony at the Samuel Goldwyn Theater in Beverly Hills this weekend. Winners were selected from 300 submissions and were judged in four categories. In the narrative film category, the gold medal was awarded to Randall Dottin‘s “A-Alike” from Columbia University. Runners-up were silver medalist Dana Buning‘s “Zeke” and bronze medalist Todd Schulman‘s “The Plunge,” both from Florida State University. In the doc section, the gold medal was awarded to Kimberlee Bassford‘s “Cheerleader” from the University of California, Berkeley. Runners-up were silver medalist Shilpi Gupta for “When the Storm Came” from the University of California, Berkley and bronze medalists David Pittock and Lindsey Kealy‘s “Cuba: Illogical Temple” from the University of Nebraska. In the animation category, the gold medal was awarded to Alexander Woo‘s “Rex Steele: Nazi Smasher” from New York University. Runners-up were silver medalist Sukwon Shin‘s “Rock the World” from the School of Visual Arts and bronze medalist Craig Van Dyke‘s “Lemmings” from Brigham Young University. In the alternative section, the gold medal was awarded to Robert Castillo‘s “S.P.I.C. : The Storyboard of My Life” from the School of Visual Arts in New York. The silver medal went to Bill Ridlehoover and Nilanjan Lahiri‘s “Focus” from the Savannah College of Art and Design, Georgia. 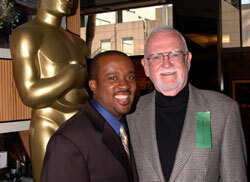 The 2004 Student Academy Award winners. Back row (left to right): Randall Dottin, Todd Schulman, Laurits Munch-Petersen, Nilanjan Neil Lahiri, Bill Ridlehoover, Sukwon Shin. Front row (left to right): Alexander Woo, Dana Buning, Craig Van Dyke, Shilpi Gupta, Robert Castillo, Lindsey Kealy, David Pittock. Winner Kimberlee Bassford is not pictured. Image © AMPAS. The Honorary Foreign Film award was presented to Laurits Munch-Petersen‘s “Between Us” from the National Film School of Denmark, selected from 39 submissions from 23 countries. 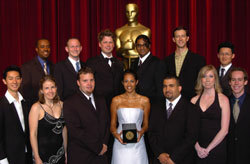 Pixar‘s Pete Docter, three-time Oscar-nominee and past Student Academy Award winner, acted as presenter for the alternative and animation categories. Five-time Academy Award-nominee for cinematography Owen Roizman presented the awards for the narrative category and documentary filmmaker Arthur Dong presented the awards for the documentary category. Academy President Frank Pierson presented the Honorary Foreign Student Award and acted as the evening’s host. American winners first competed in one of three regional competitions where as many as three finalists were selected for each of the four categories. Films were then screened and voted on by Academy members. In addition to a trophy, Gold, Silver and Bronze medalists were awarded $5,000, $3,000, and $2,000, respectively. A compilation of the year’s first prize films will be distributed to educational and non-profit organizations nationwide.